The Church of St Peter in Old Market Street, Blackley, Manchester, England, is a Gothic Revival church of 1844 by E. H. Shellard. It was a Commissioners' church erected at a cost of £3162. The church is particularly notable for an almost completely intact interior. It was designated a Grade II* listed building on 20 June 1988. The church is of "coursed sandstone rubble with ashlar dressings". The nave has buttresses and "clumsy" pinnacles and ends in a "blunt" west tower. The interior is aisled and "particularly impressive for its complete (nineteenth century) interior with the extremely unusual survival of all the fine boxes and other pews". The churchyard contains the war graves of ten service personnel of World War I and seven of World War II. ^ a b c d Hartwell, Hyde & Pevsner 2004, pp. 385-386. ^ a b c Stuff, Good. "Church of St Peter, Crumpsall, Manchester". britishlistedbuildings.co.uk. Hartwell, Clare; Hyde, Matthew; Pevsner, Nikolaus (2004). 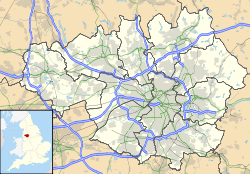 Lancashire: Manchester and the South East. The Buildings of England. New Haven, CT; London: Yale University Press. ISBN 0-300-10583-5. This page was last edited on 9 December 2018, at 07:19 (UTC).